Spent all morning driving around the coast of Arran looking for hairy coos but didn’t spot a single one. To console me, Charles took me to a fish & chips shop where, for a quid, I got a Mars bar battered and deep fried (in the same oil used for the fish & chips). I’ve long heard about deep-fried Mars bars but, having never actually come across one, considered them an urban myth. Not so. They have them here in Arran. Charles tells me the first chippies to fry up Mars bars were in the little fishing villages around Aberdeen where, strangely enough, people rarely eat fish and where, he says, the preference is for deep-fried pizza. I can’t even imagine that. But that got us to talking about where you’re likely to find the best fish & chips in Scotland. A lot of folks like the Anstruther Fish Bar, just a few minutes from St. Andrews, and, in fact, this year they won the award for “Best Fish & Chip Shop in the U.K.” That’s got to stick in the craw of some chippies from London. 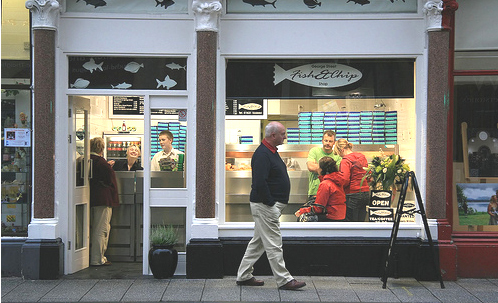 The Anstruther shop is run by a family of fishermen that can trace their work in the Scottish fishing industry “as far back as the late 1600s,” they say, and prides itself on using the best and freshest ingredients available. That’s the good news. That bad news is that it often takes as long as an hour to get a table (and almost as long for carry-out). And they charge 20p for a little packet of Heinz ketchup to go with your chips. Now that just doesn’t seem right. George St. Fish & Chips in Oban. Being a bit of an aficionado when it comes to fish & chips, I’ve tried several places on this trip. I liked the George Street Fish & Chips Shop in Oban (lovely fried mushy peas) and my first driver, Michael, and I stopped at the Real Food Café in Tyndrum, along Loch Lomond, where not only were the fish & chips fabulous but so were their venison sausages with juniper berries. But my favorite has to be the fish & chip van on the fisherman’s pier in Tobermory on the Isle of Mull. It’s run by a couple of women, Jeanette and Jane, and is as funky as it sounds with outside seating on lobster traps to go along with a sign noting that they’ve won the prestigious “Les Routiers” award. Yes, they do the usual fish & chips (and they’re quite good), but the thing to get are their fresh king scallops which simply melt in your mouth. Only problem is this fish & chips food wagon is only open April to October. I guess in winter, with the cold rain coming down, nobody wants to plop down on lobster pots on the pier to eat their lunch. Except for the seagulls. Newington Traditional Fish Bar in Newington, Edinburgh, is a newly opened fish and chip shop that is fast gaining a great reputation amongst the capitals discerning crowds. Using the finest and freshest, locally sourced, ingredients they are quickly becoming one of the best places around to get a really good fish supper. Not only is the food made to order for you, the staff are friendly and the shop is immaculate and tastefully presented… just like the food. If you’re in the area, heck even if you’re not, make the journey and try a piece of how fish and chips should taste! I’m not a real big fan of eating fish, BUT the fish and chips I had at George’s St in Oban was the BEST fish I ever had… I live in the States and nothing compares to their fish and chips… I wish I was able to order the fish and have them shipped….